House Majority Leader Joe Aresimowicz and Liz Linehan, a House candidate in Cheshire. 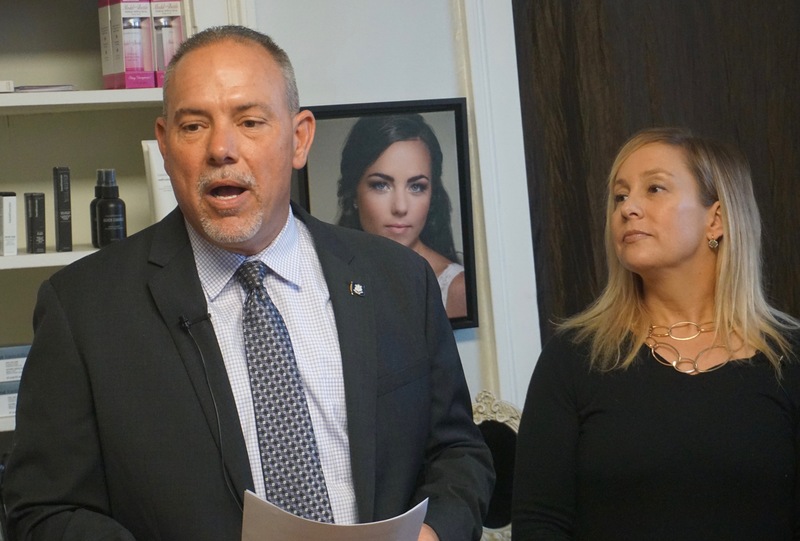 House Majority Leader Joe Aresimowicz, D-Berlin, told reporters Thursday morning that someone should lose their job over the digital attack ad a union political action committee placed against Dr. William Petit, a home-invasion survivor. By nightfall, someone did. Paul Filson, the treasurer of the PAC, resigned as the executive director of the state council of the Service Employees International Union, a post that made him the union’s political director and a regular presence at the State Capitol, lobbying leaders like Aresimowicz on SEIU’s legislative agenda. An identical ad used against Petit and several other Republican legislative candidates attempted to tie them to Donald J. Trump and his “attacks on women and families.” When directed against Petit, whose wife and two daughters were killed during a home invasion in 2007, they provoked outrage as an insensitive libel of the victim of an iconic crime. In a statement, SEIU disavowed prior knowledge of the ad its constituent unions funded through Labor United of Connecticut, citing the rules on independent expenditures. With its legislative allies embarrassed, angry and calling for a dismissal, SEIU placed all blame on Filson and the PAC’s creative consultant. “Because of regulations inherent to independent expenditures we, as an organization, are not permitted to know the content that is distributed on behalf of those political efforts. Campaign finance laws are explicitly clear that there cannot be any coordination between our organization and that of Labor United for Connecticut. Therefore, our organizations were not in a position to vet, approve or even be made aware of the digital ad that ran in Dr. Petit’s district. DKC, a public-relations and advertising firm in New York City that prepared the ad, was fired, said Jennifer Schneider, the communication director of SEIU 1199, New England. “I think the bottom line was the ad wasn’t in keeping with the standards SEIU has. External pressure didn’t play into it,” Schneider said. Aresimowicz, who is set to become the speaker of the House in January if the Democrats retain their majority, denounced the ad in particular and independent-expenditure groups in general while campaigning with Democratic candidates in Cheshire, the community where Petit’s wife and daughters were killed. “I think it was absolutely disgusting. It was absolutely vile, and someone should lose their job,” Aresimowicz said. Petit has since moved to Plainville, where he grew up, has remarried and is running against Rep. Betty Boukus, D-Plainville. He and House Minority Leader Themis Klarides, D-Derby, held a press conference outside his home Wednesday to denounce Labor United. Betty Boukus and William Petit outside his home. 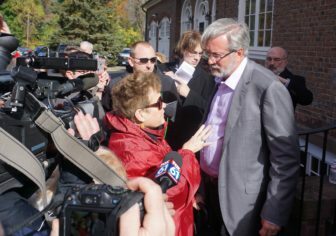 Aresimowicz said he asked his staff to explore what steps the legislature could take to limit the use of independent expenditures in Connecticut, probably a futile task given that the U.S. Supreme Court ruled in Citizens United that independent expenditures are speech that cannot be limited. He said he was reacting both to the Labor United ad and a CT Mirror story about the prospect of negative ads placed against Democrats by Grow Connecticut, a local Super PAC funded by a Washington group that draws contributions from major corporate and conservative donors. Aresimowicz questioned how effective the negative ads would be. House Republicans, meanwhile, intended to press Friday for Democrats to denounce the Labor United ad wherever it is used, keeping Democrats on the defensive.